Eighty-five competitors took part in the first qualifying round of the Highland Ladies Open at Pitlochry. Bathed in glorious sunshine and perfect conditions, scores were higher than one might have thought they would be. 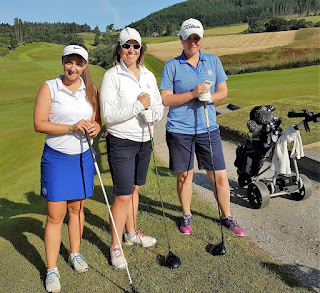 Defending champion Eilidh Watson (Muckhart) posted a two-under-par 70 with local player Kay Knight second on 74, followed by two previous champions in Laura Walker (Muckhart) and Louise Fraser (Kingsknowe) on 75. Fifteen-year-old Mollie O'Brien from Reay GC, playing in her first "Highland" is lying in eighth place on 81. Elaine Langlands (St Michaels) had a hole in one with a nine-iron at the fourth hole. out to play their first qualifying round.